The Chinatown Partnership Local Development Corporation is planning to clean up the streets and set up programs highlighting Chinatown's cultural attractions in an effort to attract more New Yorkers to the neighborhood. 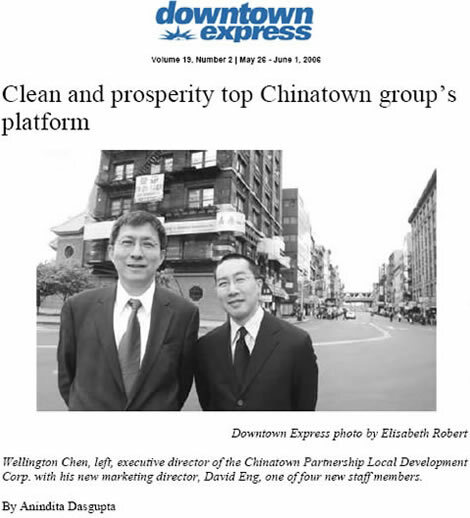 "We want everyone to see that Chinatown is more than great Chinese food and cheap handbags on Canal St.," said David Eng, the group's newly appointed marketing director. The partnership, an outgrowth of the Rebuild Chinatown Initiative, has just completed their search for a permanent office, and is planning to move into a space in Chatham Square this fall. Established in October 2004, they have finally found a location that offers space at street level - something executive director Wellington Chen was adamant about. They chose Chatham Square in part because it is the meeting point of seven roads; a natural meeting place. They are currently working in Midtown, out of a Chinese advertising agency, Admersasia. Eng is optimistic about the upcoming changes. In addition to moving to a permanent space, the partnership has just added four new members to its senior staff and three new members to its board. The new senior staff and board are in the process of planning a number of programs meant to rejuvenate Chinatown and bring people back to the neighborhood. One of these initiatives is the Clean Streets program said to start this summer. "Right now people know Chinatown as dirty," Eng said. The program will be the first centralized effort to make sure the streets of Chinatown are kept clean on a daily basis. In addition to the regular clean up crews from the city's Sanitation Department, the partnership's crew, clad in matching uniforms, will make their presence known to both consumers and local businesses, sending the message that they are making an active effort to rejuvenate Chinatown. Al Rahner, newly appointed operations director, will direct the Clean Streets program. In addition, the partnership hopes to run a trial night market in the fall, full of performers and artisans' crafts. The group hopes the night market gives small businesses a good reason to stay open longer. Funded in part through a grant from the Lower Manhattan Development Corporation, the partnership was created with the goal to improve business conditions in Chinatown by making the streets cleaner, safer and a more attractive place to conduct business in. After the September 11th terrorist attacks left Chinatown in disarray, the L.M.D.C established the partnership to rebuild Chinatown. "If there was one good thing coming out of September 11th, it was this," David Eng said. "Who knows what would have happened to Chinatown otherwise." There are also plans for a Heritage Trail, where visitors will take walks around Chinatown, looking at historic sites, such as Chinatown's first laundry mat. In addition, there are also plans for the Way Finding project, which will implement more specific and visible signs around Chinatown. It is not clear when these programs will begin, but Eng believes they will start, "as soon as possible." Chen, in a statement said he is "thrilled and excited by these additions. They... will work on behalf of Chinatown to help build a better place for everyone who lives, works or plays in this neighborhood."